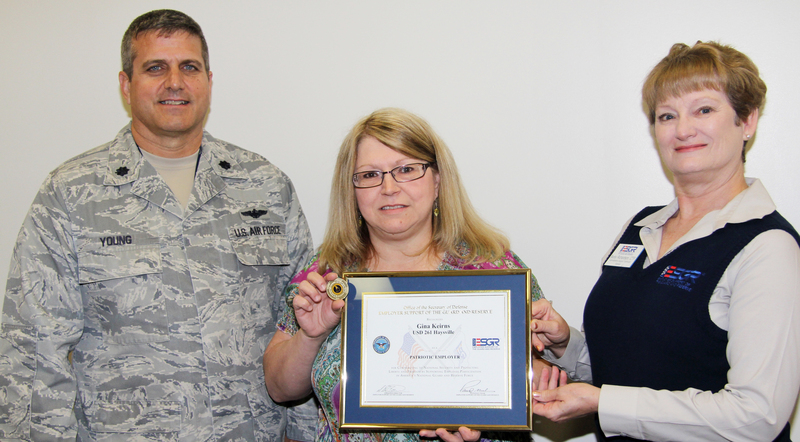 Haysville USD 261’s Gina Keirns, Tri-City Day School Administrator, was recently honored with the Office of the Secretary of Defense Employer Support of the Guard and Reserve (ESGR) Committee Patriot Award. An employee serving in the National Guard or Reserve, or the spouse of a Guard or Reserve member, may nominate individual supervisors and bosses for support provided directly to the nominating Service member and his or her family. The Patriot Award reflects the efforts made to support Citizen Warriors through a wide-range of measures including flexible schedules, time off prior to and after deployment, caring for families and granting leaves of absence if needed. Senior Airman Darren K. LaKous, Tri-City Behavior Technician, submitted the following about Keirns in his nomination.